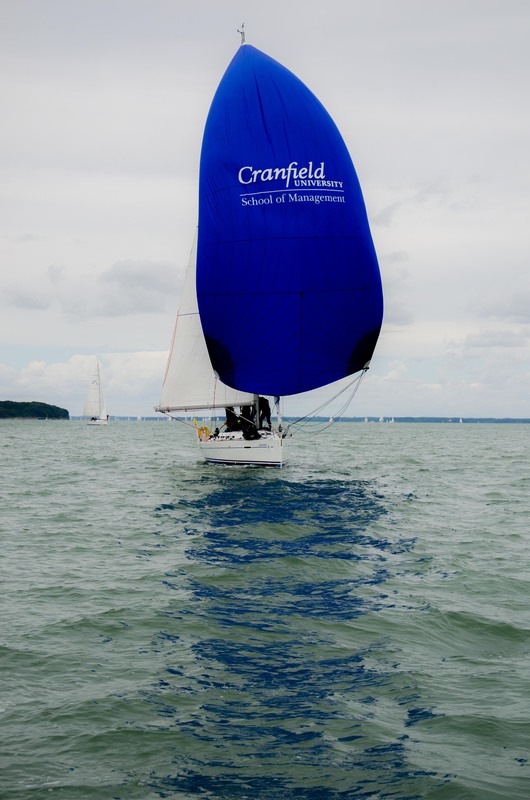 Cranfield Business School won the 2015 edition of the Cranfield Regatta, winning three races out of the five. This season’s leading team, Skolkovo could only manage second place, winning the two other races. INSEAD came in third, while 2014 winners, LBS came in 4th. The Cranfield team was led by a professional skipper and first mate, provided by the charter company. The Cranfield regatta marks the mid point of the Sunsail MBA Global Sailing League, and is sailed on the waters of the Solent, between the Isle of Wight and the Mainland on the South Coast of England. The waters are famous for their tricky tidal currents, and frequent traffic – whether it be other racing yachts or massive cargo ships. The Sunsail MBA Global Sailing League’s sponsor, Sunsail, provided the boats, the race committee and a lot of the organisation. The boats are Sunsail’s matched fleet of Beneteau F40s, which provide a different challenge to the smaller boats seen in most of the series’s regattas: Crews of 8, 42 ft boats and large symetrical spinnakers with dip-pole gybing. As ever, this was the biggest one- design fleet of the season: 18 boats from 10 business schools competing. Next up, the waters of the Ijsselmeer in the Netherlands. Moving from the biggest boats of the circuit to the smallest.